《主に米国で用いられる》 (道路の)中央分離帯 (《主に英国で用いられる》 central reservation). Keep off Median 【掲示】 中央分離帯乗り入れ禁止. 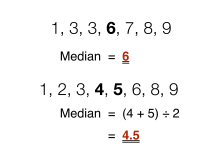 the median line [point] 【数学】 中線[点]. 中央の, 中間の, 正中の.22等分する面の, 左右対称に分ける面の.3〔数学〕メジアン[中央値, 中位数]の[に関する]；中線の(【略】med.). Borrowed from Middle French median, from Latin medianus (“of または pertaining to the middle”, adjective), from medius (“middle”) (see medium), from Proto-Indo-European *médʰyos (“middle”). Doublet of mean and mizzen. Cognate with 古期英語 midde, middel (“middle”). More at middle. Why is not our jugular or throat-veine as much at our command as the mediane [transl. mediane]? The Greeks prescribe the median or middle vein to be opened, and so much blood to be taken away as the patient may well spare, and the cut that is made must be wide enough. (geometry) A line segment joining the vertex of triangle to the midpoint of the opposing side.